Tesla didn’t score. Game over? Tesla Motors will go public next week. The car manufacturer expects to raise about $185 million by selling some shares, you can read all details about the filing on the SEC website. What you will have to read first is that Tesla Motors has lost $30 million this first quarter. That sounds bad, and it is, but it’s far from unusual for this company. In fact, Tesla Motors got incorporated in 2003, and it has reported negative results every quarter since then. 7 straight years of loss! Of course, I understand that when you start a business, it takes some time to make profits. And you may argue that if Tesla Motors has been a huge failure from a financial point of view, it’s a communication success. As the first, and only, manufacturer of an electric car people can dream of, Tesla Motors has secured its fame in the automotive history. Question: how much is that worth? We value a company from its cash flow, and from the size of its customer base, but Tesla Motors has a negative cash flow, and a tiny customer base of barely one thousand individuals. Many bankers would say that Tesla Motors isn’t worth a dime. Some other people would say that Tesla Motors is worth a fortune because it has potential. Let’s talk about it. 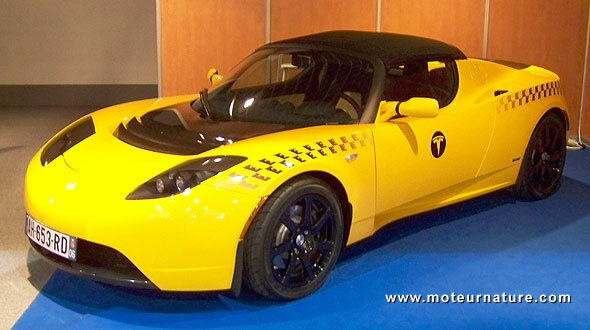 The Tesla roadster, the only model Tesla has sold so far, is 5 years old, and it’s based on the Lotus Elise, which was introduced in 1995. Its electric propulsion system is the best available, but the rest of the car is not. Far from it. Most notably, the roadster has very poor ergonomics. Being 6’3″, I found it very difficult to get into it, and it was even more difficult to get out! Buyers tend to agree, sales are down. The future of Tesla belongs in the Model S, a pretty good looking full size sedan that is expected in 2012. There’s not a single doubt that Tesla Motors will keep on loosing money till this new model is available. But that’s not the end of trouble, because Tesla Motors has already announced very aggressive pricing for this new model. The profit margin, if any, will be razor-thin. And that spells trouble, huge trouble, for a company which will have 9 years of accumulated losses. Can you imagine a company that after 10 years in business is still loosing money? This is what Tesla’s future looks like, with more than $750 million of debt! These are not the kind of numbers that makes investors salivating. To make things worse, today Tesla has an advantage. There’s no competition. That will no longer be the case in 2012. Nissan is already taking orders for its Leaf, a brand new and very promising electric compact sedan, and several other large manufacturers are readying their products. How about buying Nissan shares instead of Tesla? The automotive industry is complex, but there’s a rule that says it’s much easier to make money selling a few high-priced cars, than selling a lot of cheap cars. As Tesla has failed being a niche manufacturer, I have every reason to doubt it could be successful making volume. And let me add that actually, Tesla has never built a car. The roadsters are made by Lotus in England. How do you evaluate the risk of this total lack of experience, when you estimate your return on investment? Elon Musk, Tesla’s founder, CEO and main single shareholder, is quick to point that his car is faster off the line than a Ferrari. But does he know that Enzo Ferrari made money making its first cars? Enzo Ferrari is remembered as a great man, making great cars, but Elon Musk is not in the same league. I think its best talent is to convince other people to lend him their money. Will Tesla’s IPO be a success? I wish it will fail. Because I believe the success of a company should not depend on the ability of its manager to convince investors, but on its talent to generate a positive cash flow within a reasonable timeframe, and make profits. I believe in electric cars because they are sustainable cars, but a company loosing $10 million a month, and that will keep on loosing money for at least 2 more years, that is not sustainable!